Summer Salt is an excellent waterfront property located on Bailey Island. 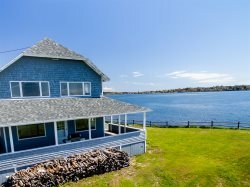 The property offers magnificent open ocean views of Casco Bay and views of Ragged Island. Standing outside on the large back yard, one can hear the sound of the waves crashing on the pebbly shoreline. The sounds and views of the ocean are relaxing and breathtaking and can be enjoyed from the yard and the deck that wraps from the front to the back of the house on one side. The deck is perfect for all your vacation wants and needs such as sipping on coffee in the morning, enjoying an afternoon beverage, having a lobster bake or BBQ, and visiting with friends and family. The interior of Summer Salt offers incredible space on both floors. The first floor has a nice sitting room to relax and watch television or for the kids to play games, a very open and spacious living room to enjoy one another and company, and a practical kitchen and dining area to cook and entertain family and friends for a delicious dinner (with lobster as the main dish of course). There is also a Master bedroom with windows all along the back wall offering gorgeous views of the ocean. If you open the window at night you will surely fall into a tranquil slumber as the sound of the waves sing you to sleep. On the second level are four additional bedrooms, one being a second master bedroom. All of the bedrooms are considerably large and would make comfortable bedrooms for any guest. Summer Salt is conveniently located within walking distance of the Giant Stairs Seafood Grille (a local fishing family owned restaurant), the Bailey Island General Store (filled with all necessities including beer and wine), and Seaside Creations (a local gift store with nautical treasures). There is no doubt that Summer Salt will provide a wonderful vacation for any and all guests. This was our third stay at this house, and we hope to return every year that it continues to be rented. Its very well equipped for all of our needs. The furnishings are comfortable and appropriate for beach rental property. The extra fridge in the garage was great for overflow storage and beverage cooling. This is a very spacious house that accommodates a large number of people easily. It's very comfortable for a large family group, and its oceanfront setting is a plus.